Disclaimer: I received WIN Sports Detergent in exchange for my review as part of being a BibRave Pro. Learn more about becoming a BibRave Pro (ambassador) and check out BibRave.com to review find and write race reviews! The snow season makes up about six months of the year around these parts and so enters a whole different kind of running. Instead of shorts, tanks and sunscreen, it's all about Yaktrax and layers upon layers of clothing (still wear the sunscreen though). Though the change of the season is to be expected, especially as a lifetime-Minnesotan, the large increase of dirty laundry in the cold months always catches me by surprise! And it's not just my own - throw in the snow pants and many winter layers for three kids (+ my hubs) and we may just be able to sled down my laundry mountain. To conquer my laundry mountains and attack the sports-stink in our athletic wear, I received WIN Detergent as a part of being a BibRave Pro. Since the majority of detergents are designed to combat stains and stink in cotton-based items, these detergent prove to be not as effective on the synthetic fabrics used in our sweat-wicking activewear. Those synthetic fibers are considered "hydrophobic" which allows water (and sweat) to wick away from your body and evaporate quickly. That is perfect for activewear BUT this hydrophobic material can hang on to that sporty stink if only regular detergents are used. That's where WIN comes in. The fundamental difference between WIN and other detergents is that WIN contains ingredients that separate oils from the synthetic fibers, thus washing away the oils and bacteria that = stink! Makes sense, right? I have been testing the WIN High Performance Sports Detergent for a few weeks now and it has indeed cleaned up even my stinkiest running attire. This detergent is available in Fresh Scent and Fragrance + Dye Free. One 32 oz bottle of WIN Detergent is $10.95 on Amazon, plus free shipping if you have Amazon Prime. That's affordable and certainly worth a try. Save 20% off your windetergent with code RAVE4WIN on their website. Code is good until 1/15/19 and one offer per household. Grandma's Marathon in June, 3:32:17. Check that one off the race bucket list! Injured in August. Hip flexor strain that took 4 months to completely heal. Many frozen miles ran for that spring marathon, and then I missed the entire tail-end of summer and all of fall running and racing! What is a highlight from your 2018? 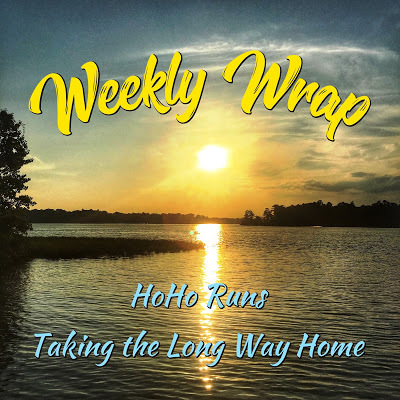 Easing back into running after a severe hip flexor strain in mid-August. SUN: At my parents' farm for Christmas. Strength: Kratos hip strength routine from RunnersConnect.com (more on this later!). MON: 4.08 mi, 34:02 @ 8:20/mi in the snow. Strength: Atlas core strength. WED: (Treadmill) 4.08 mi, 36:08 @ 8:56/mi. Strength: Poseidon full body strength. THURS: (Treadmill) 6.21 mi, 55:25 @ 8:56/mi. Strength: Bia hip strength. It's quite likely that I'm stuffing my face with Christmas leftovers and possibly overdosing on pie and lefse. May you have a blessed Christmas celebrating our Savior's birth with friends and family! Disclaimer: I received a Zwift RunPod in exchange for my review as part of being a BibRave Pro. Learn more about becoming a BibRave Pro (ambassador) and check out BibRave.com to review find and write race reviews! Let's just throw this out there right away: I have been either on the treadmill or not running at all lately. Strep throat threw me for a loop but my motivation to run outside in the dark on icy roads has been dwindling too. Now is the time to, first, get healthy again and then gradually build my running base before marathon training starts in mid-January. Good news here is all signs of my hip flexor injury are gone! That is a huge answer to prayer and I'm praying that it doesn't pop up again as mileage grows. The treadmill (or "dreadmill") may be notoriously smack-talked by runners because it's boring but, when it comes to real life, it can be quite a "run saver". I can turn on my kids' favorite show, currently the PJ Masks, and fit in a few miles while they watch and the baby eats Cheerios. A few miles on the 'mill is certainly better than no miles at all! As a BibRave Pro, I received a Zwift RunPod to take my treadmill runs to exciting virtual training locations. Through the Zwift RunPod, you run in the "real world" to power your avatar across various courses all over the world. To get set up, I first needed to create a Zwift account (for free) and download the Zwift app on their website. The download did take a while, so plan ahead and start the download before it's time to run. I used my Mac laptop to do this and other BibRave Pros have used their phones and iPads as well. 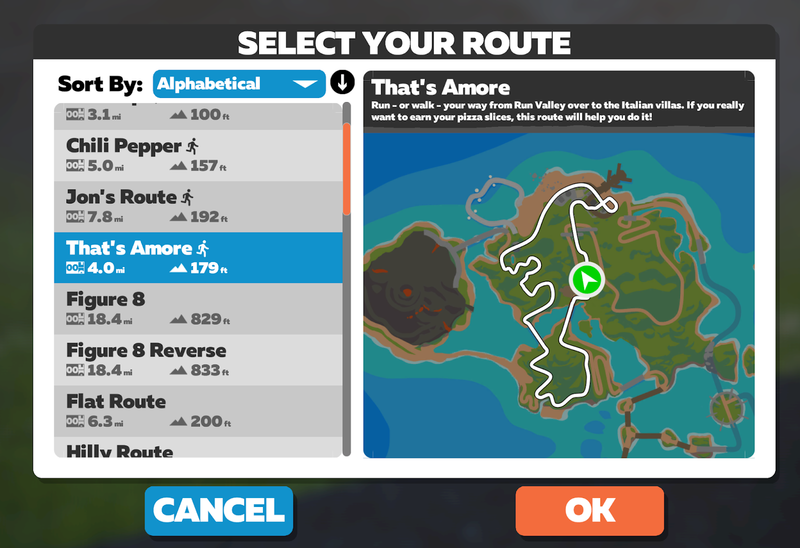 Zwift is compatible with many but not every device. I was hoping to run the program on my Amazon Fire tablet but it wasn't compatible. 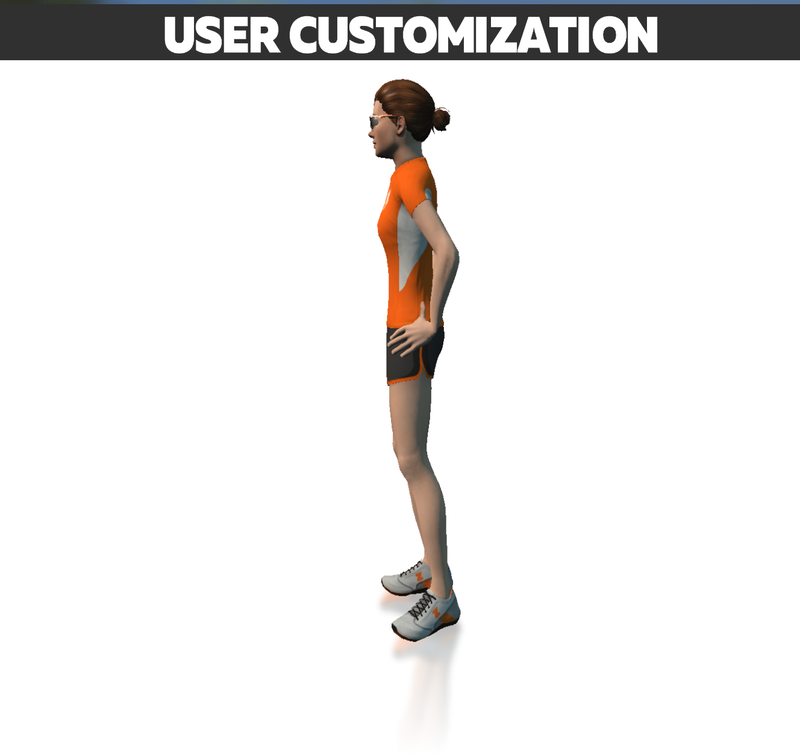 After I downloaded the app and logged in to Zwift Run, I was able to customize my avatar's outfit, skin color, hair and accessories. As you accomplish more goals in the game, you "earn" access to more avatar items - much like in a video game. All that was left to do is RUN. From my treadmill, I ran all kinds of crazy places, which my kids thought was awesome. They even saw Santa! To see a video from my run, check out my Instagram post and arrow right. Though I don't see myself using Zwift regularly, I am glad I was able to experience this virtual run technology. Call me old school, my little iPod shuffle is all I need for an indoor run. That being said, with the huge popularity of virtual games these days, virtual experiences like this that actually require the user to move their real world bodies would make for some major health gains. For 15% off a Zwift RunPod use "BibRave15" at Zwift.com. Offer is good for the first 1000 Pods only! If you could run ANYWHERE on earth, where would you run? Easing back into running after a second degree groin pull/hip flexor strain in mid-August. MON: Feeling much better on Day 3 of the antibiotics. Went for an easy 2-mile treadmill run with the Zwift app. 2.01 mi, 17:33 @ 8:45/mi. WED: (Treadmill) 4.01 mi, 34:41 @ 8:39/mi. 1:00 plank variations x 6. THURS: (Treadmill) Easy-Effort 3.41 mi, 30:02 @ 8:48/mi followed by 3 x 15 front squat reps with 20#. Getting back into regular running, I'm noticing I need to be more disciplined with my paces. Like this "easy run" should have been at an even slower pace! And the workouts need to speed up. Getting back at it! SAT: 6.35 mi, 55:05 @ 8:41/mi OUTSIDE in the fresh snow!!! A little hard to run in with ice underneath but I was sure glad to finally run outside again. I was planning to write about returning to the rhythm of marathon training until my early Christmas present arrived. As the kids opened their stockings for our Christmas party at home, my oldest said, "Mommy, but what are you going to get for Christmas?" I answered, "Daddy got me a new floor (finished this week!) and a new rug." "No, like a real present! ", he responded. I then should have said, "Mommy got strep throat, sweetie. Now let's go find some antibiotics to stuff my stocking with." ;) I joke. Getting sick is part of life and having three small people (one in particular that licks everything) makes it that much easier to get sick. For how healthy of a year we have had in 2018, I won't whine too much about getting strep now. It's an easy fix, thanks to my doctor visit yesterday. Day 2 and I'm already feeling much better. Let's quickly recap this year and look forward to what's in store for 2019! 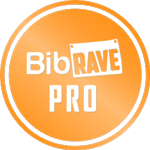 I joined the BibRave Pro team for my second year and ran one race with them along with writing 23 reviews. Three races were run: The Frozen Feat 10k in February, Grandma's Marathon (with BibRave) in June and the Grand Forks Half Marathon (injury deferral) in September. We are currently half way through E's Kindergarten year using the My Father's World curriculum and continue to homeschool. Tee Ball, swimming lessons and now wrestling & 4H have been fun activities for the kids this year. Baby C is now considered a "toddler" as he started walking at 10 months old. He had his first birthday in November and first bloody nose last week (not so fun). Fall marathon plans were derailed after my hip flexor strain in August. Four months later, I'm fully recovered. We traveled to Nashville, TN for a family reunion over Thanksgiving. The "She Runs By Faith" blog re-design! After listing our house for sale, then deciding not to sell and reflooring instead, I showed our house last Friday and moving is back on the table again. You just never know what God has planned but we're following His direction. I'm trying to patiently go with the flow... trying. Returning to the Frozen Feat 10k in February and Fargo Marathon in May (& celebrating our 7 year anniversary!). Possibly one or two more marathons, if I can stay injury-free. Still chasing that 3:15 finish time and being more diligent with strength training and stretching. E will be finishing Kindergarten this Spring, and then we're on to 1st Grade and W starting Pre-K in the Fall. Ahhh my boys are growing up so fast! Weaning "Toddler C" eventually, as we did complete the goal of breastfeeding for 12 months! I won't wean until him and I are both feeling better though. I have been accepted for the 2019 BibRave Pro team but am considering stepping back. It's been a great couple years with BibRave but finding time to do any blogging and/or review writing lately is a battle. We'll see. Nature journaling, painting, sketching. I want to do more of that and teach my children more about it! Now that they are getting older, we may be able to slow down for two seconds to nature journal more. And possibly moving? I hate to be the skeptic but I'm not counting my eggs until they hatch. We'll see what the new year brings. And because showing our current house has been in the forefront of my mind and moving has jumped back into the picture, I have to share this in-home "coffee shop" idea. Isn't that awesome? I would love to set up my own coffee corner in the future! What's going on in your life lately? Anything to celebrate from 2018 or look forward to for 2019? TUES: Hip strengthening exercises and I signed up to run the Frozen Feat 10k in February! That race is one of my favorites. They have the best socks for race swag and a February race, while icy and cold, helps to break up the long winter. THURS: Starting to feel sick. Decided not to run. SAT: Sick. Finally went in to Urgent Care because I wasn't able to sleep at night through the throat pain. Figured it was strep throat, and strep it was! Started antibiotics ASAP. 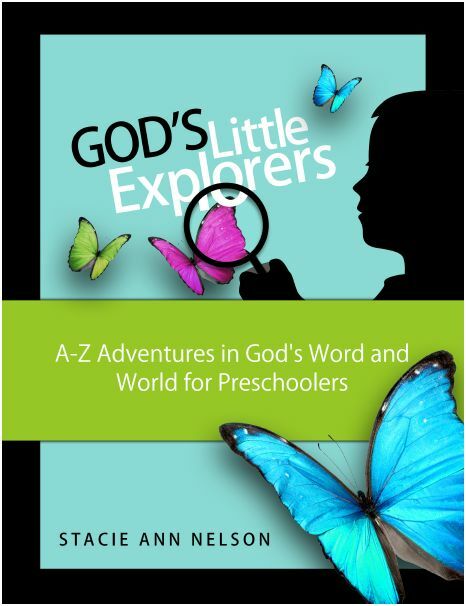 For my oldest son's preschool year, we followed the God's Little Explorers Preschool Curriculum by Stacie Ann Nelson at "Motherhood on a Dime". This is a 28-week lesson plan that travels the Bible from Genesis to Revelations and explores a new letter of the alphabet per week as well. I decided to use God's Little Explorers as our preschool curriculum because, as a new homeschooling mom that wasn't homeschooled myself, I wanted a guide to follow throughout the year that would ensure my oldest was introduced to key preschool concepts. I also knew I would need something to serve as a guide for my mind when life felt otherwise chaotic (i.e. our third baby was arriving that November!). The curriculum is a downloadable file that is available for $20. I then printed it from my home computer/printer in black and white. The resources required were mainly standard school supplies and I used our Jesus Storybook Bible and My First Message Bible for the Bible readings. Purchasing the "Wee Sing Bible Songs CD" is recommended though I just looked up each song on YouTube and saved a playlist there. Bible Adventure: Reading the Bible story, singing any recommended songs, and related craft or project. Theme Adventure: Explore the theme with crafts, science projects, cooking projects, and so forth. ABC & 123: Specifically introduces an alphabet letter. We also explore colors, shapes, and numbers during the year. Life Skills: Review various self-help skills, learn to complete chores correctly, practice manners, and do a service project. I’ve also listed additional activities you can use to substitute for ones you might not like or have time to complete. Book Bag: I list books to go along with the theme and sometimes suggest an activity to be completed around the book. Learning Bags: These are my version of busy bags that can keep younger siblings busy while mom works with an older student. My two oldest boys were 2 and 4 years old when we used this program and the hands-on projects were a home run for both of them (with special modifications for my 2-year-old, of course!). Stacie presents many craft and hands-on ideas for each week to choose from. We usually picked one or two to focus on as our crafty attention spans diminished fairly quickly. Along with the "hands on" projects being a hit, we followed many of the "Book Bag" read aloud recommendations and added a few of our own as well. Throughout the year and that summer, we enjoyed E.B. White's "Stuart Little", "Charlotte's Web" and "Trumpet of the Swan". The kids ate those up! We ended up creating our own version of the "Learning Bags" in box form, called the "Busy Box". Having a few simple activities, puzzles and little books stored up for my younger boys has helped greatly even in Kindergarten this year, too. The most valuable portions of this curriculum for me personally were the Hymn, Composer Study, and Artist Study recommendations each week. Little did I know, we were being walked through the beginnings of our own "Morning Time" routine. The habit of studying these beautiful ideas was being formed and we built on that in the following school year. My children and I greatly benefited from using the God's Little Explorers Curriculum for our first year of homeschooling and I highly recommend it for those who are also just starting out. This is an aesthetically well-designed, affordable preschool curriculum and we made many fun memories together using it! Click here to visit Motherhood on a Dime. Disclaimer: I received SABRE Red® products in exchange for my review as part of being a BibRave Pro. Learn more about becoming a BibRave Pro (ambassador) and check out BibRave.com to review find and write race reviews! I have been a solo runner ever since moving to this town five years ago and more than once I have received comments like "Your husband lets you run out in the dark?!" Umm... yes. He "lets me"? While he doesn't exactly love me running in the dark, he does know it's the only chance I have to get out and he trusts me to run smart. (Plus he married me this way, knowing well of my independent streak ;) And I'm thankful he does trust me. For a while now I have been feeling like I should find pepper spray or some sort of defensive product to take with me on runs. Whether running in the dark or even in broad day light on desolate country roads, being a solo runner just isn't that safe anymore. Animals are my main concern here (especially bear) but, after the terrible events in the news lately, you just never know. As a BibRave Pro, I received SABRE Red® Runner Pepper Gel along with two other self defense products to test while running. SABRE Red®'s motto says it well. Choosing to run safe isn't a sign of fear or weakness, it's smart. Now that all of my week day outdoor runs happen in the dark, it's time to step up my safety game. I wear my reflective gear and carry handheld lights (a necessity because drivers DO NOT pay attention!) which help me to be easily seen but they don't offer any sort of defense if I am approached by a person or critter. That's where the pepper gel comes in. The Runner Pepper Gel (middle product in above picture) has an adjustable hand strap which makes it very easy to run with and contains 35 police-strength bursts to spray. On dark runs, I carry the Pepper Gel in my right hand and a handheld light in my left hand. It's lightweight and deploying is simple to do after switching off the safety. The key is to remember to switch the safety back on after testing to prevent accidental discharge. I did a test spray and the stream of pepper gel covered quite a distance - potentially 12 ft, though I didn't officially measure it out. One more SABRE Red® product that I will carry with me on my solo runs is the Personal Alarm with clip & LED light. I use this alarm as my first "line of defense" when a dog is aggressively approaching me and it has caused the dogs to turn around and reconsider nipping at my legs! Really I want to use the pepper gel as a last resort, because I do love animals, but when one is running at me baring teeth and fluffing up its back fur I need to do something. The personal alarm serves as that something. It is very loud and I like the added LED light feature too. While personal defense moves are very helpful, I do feel like these SABRE Red® products are a near essential for runners who hit the roads solo, like me. No matter how "strong" I think I am, my somewhat small 120-lb frame stands very little chance against a large animal or even human aggressor. The SABRE Red® Pepper Gel and Personal Alarm may not be the cure-all for every danger in today's world but this is an easy, discrete and affordable safety measure for me to take and it's certainly much better than nothing. The Runner Pepper Gel with Adjustable Hand Strap is available for $12.99 (check your state's laws on pepper spray!) and Personal Alarm with Clip & LED is $14.99. Join us for #BibChat on December 4th for a chance to win your own SABRE Red® products! What measures do you take for personal defense? Do you hit the road solo or in a group? SUN: Flying home from Nashville, TN! We were all exhausted and so glad to be back in MN. WED: (Treadmill) 3.3 mi 00:30 09:05 pace. THURS: (Treadmill) 4 mi 00:37 09:09 pace. Feeling AWESOME because I can’t feel that hip flexor strain anymore. It feels so good just to run again, no limp, no pain. I can tell I’m out of running shape though ;) I’ve got some work to do! SAT: 6.2 mi 00:49 07:50 pace. November was my "easy run" month and now it's over! Time to start pushing the pace and seeing how my hip handles it. How much can change in 5.5 years, really? Turns out, a lot. Almost 26-year-old me started this blog as a writing outlet to jot down thoughts about my faith, brand new motherhood, running. As a journaler since my elementary years, having a blog was only natural. 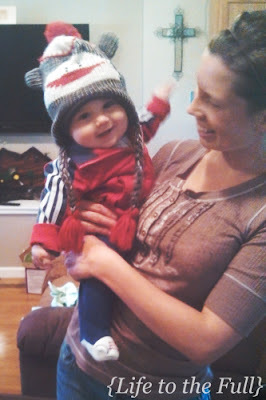 I was on maternity leave with my one-month-old baby boy, who had arrived 5 weeks earlier than his due date. Hubs was finishing his degree, soon to graduate and celebrate our first wedding anniversary. I worked as a corporate graphic designer. Our house was small yet cozy, approximately the size of a two-bedroom apartment. That house fit our little family perfectly as we navigated a season of much newness. Thriving in the 30's, I'm 31 years young. Considered old by some but still viewed as too young to know anything by many. Still writing, just from the perspective of a not-as-new mom that still loves Jesus and a good run. I do drink more coffee than I did 5 years ago. There are now three wild boys running our halls, in thankfully a bigger house; ages 1, 3, 5. When people say our current house is small, I just laugh inside. Clearly they hadn't seen our last place! 6 years of marriage, moving, new career for my hubs. Loving on these littles and homeschooling Kindergarten is my full-time gig. Crazy but I love it. I may be a little crazy myself. I felt the nudge to redesign and ran with it; quickly, too. My blog's name and design needed to fit the mission. Prayed, brainstormed, designed and BAM! The name cuts right to the chase: I am "she". That she does often "run". And, every single thing I do, everything, is done "by faith" and my faith is in God alone. Making the time to write has been harder to do with a growing family. Lack of time isn't the main cause of this writer's block though; it's feeling incompetent. The more kids we have, the more I am reminded of how little I know. There are so many curve balls in life, often I feel inadequate, but by faith and in the Lord's strength I'm doing this. Baby steps. Every day. And so I will keep writing real life thoughts about real life things. The beautiful moments and absolute chaos that is motherhood, a heart overflowing with love while simultaneously feeling completely overwhelmed. And running. The pushing of physical limits that somehow serves as a de-stressor, stirring that inner competitive fire, running after goals that weren't even conceivable 5 years ago. Because doing hard things is fun and sweating is good for you. ... For someone with a writer's block, this post is becoming quite long-winded! This is me most days. At least one child attached to my body. Wearing leggings or my favorite jeans. A nurse-able top. Hair up because baby still pulls it out. Carrying at least one book, leaving a trail of pens wherever I go. Always looking for a lost pacifier. The life of faith is a blessed but not bump-free journey. Living for Him is choosing the narrow road and pressing on with that eternal hope and perspective, despite resistance and criticism from this world. Oh, there will always be criticism on this side of heaven and plenty of it! Living by faith is not easy (especially for a people-pleaser by nature, like me) but the eternal reward outweighs any earthly discomforts now. In spite of feeling ill-equipped, God continues to turn my weaknesses to strength so that I can love by faith, teach by faith, write by faith, walk by faith. Then again, why walk when you can run? Without battling traffic while traveling for hours, paying outrageous amounts for a hotel stay or waking up at crazy early hours, we completed a race series. My dog, Saul, and I participated in the Scooby Doo Virtual Run Series from the comfort of our own small town and on our own schedule! This run series included the Doo Good 5k in September and the Scoobtober 5k/10k in October. We covered the miles at our own pace, which was perfect for our team as Saul is an elderly ole boy and I have been recovering from a hip flexor injury myself. For more on the Doo Good 5k, check out my post here. October in northern Minnesota started a tad bit snowy, then fall weather returned and then the rain. Rain, rain, rain. Needless to say, running with my four-legged-running-buddy was a bit spotty. We put on some miles walking with the kids in the stroller and biking. Some days, Saul joined me for the warm up on my longer runs. I was starting to doubt we would hit the 6.2 mile mark by the October 31st deadline but slowly, steadily, we did it! We finished our Scoobtober miles just in time and shortly after, our race swag arrived in the mail. I received the Official Scoobtober Backpack, Scoobtober Virtual Run Finisher Medal and Digital Finisher Certificate. Because I had opted in for the dog add-on, Saul received his own race swag that includes Scoobtober Dog Bandana and Doggie Medal/Tag. 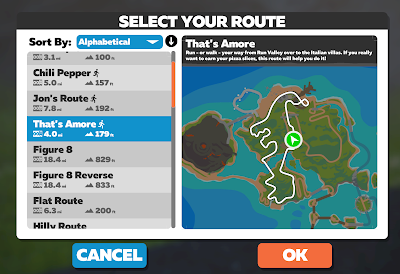 The ease of deciding for yourself where, when, and how far to run throughout the race's timeframe makes the virtual run an appealing race option. Especially for new runners or those new to the racing world, a virtual run takes the stress out of race day while still motivating you to get out the door (or onto the treadmill)! Did I mention all three of the Scooby Doo Virtual Run Series medals are huge?! They certainly went big on those - well done, Scooby Doo Run, well done! The one thing I feel is missing from a virtual run experience is the running community, which also happens to be one of the top reasons I love racing. Now a fun solution to that would be completing the virtual run series with your local running club or RBF (running best friend) and their pups. That is a virtual race experience I would love! Add the community to the virtual run and I'm on board. For someone looking to sign up for their first-ever virtual run like me, the Scooby Doo Run Series is the perfect one to start with. Participating was a breeze, logging your miles is stress-free and the race swag is EXCELLENT! Even better, bring your pup along for the run. The doggy add-on option was totally worth it. Which, if any, virtual runs have you completed? Easing back into running after a groin pull/hip flexor strain in mid-August. FRI: Cycling 10.05 mi, 00:30 @ 20.1mph pace with arm strength during and plank routine at night. SAT: Power cleaning and rearranging!